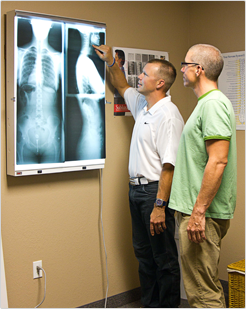 Most Chiropractors have a "One Technique Fits All" approach to patient care. This is not the case at Fredrick Family Chiropractic. The reason that we have been successful with so many different types of patients over the years is that we evaluate each individual who comes in and match the appropriate Chiropractic Technique with that individual's needs and apply it in a skillful manner. This is the technique that most chiropractors use and what most people think of when visiting a chiropractor. This is the type where you hear a crack when the adjustment is delivered. This technique involves special sections in a table that "drop" when the adjustment happens. This is primarily for lower back, pelvic problems and hip misalignments. This involves a special tool called and the Activator which has a spring inside of it that can be adjusted to deliver very delicate and precise adjustments with no force. This is a non-force technique and will work for anyone but is especially useful for those who don't like the "cracking" of traditional chiropractic adjustments. 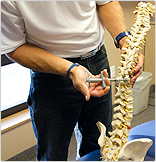 This technique involves a special table which hinges in the center for "flexing" the patient both forward and sideways and is primarily for low back disc conditions. It is especially useful for severe low back pain and herniated discs. Dr. Fredrick has saved many patients from having surgery with the use of this technique! This is done on specialized tables that have rolling drums inside that massage the muscles of the spine and separate the vertebrae over 400 times in a 10 minute session. This causes the uptake of fluid into the intervertebral discs and creates more space and therefore less pain. 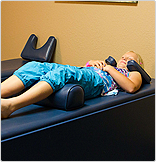 Many patients choose this therapy following their adjustment for even better results.